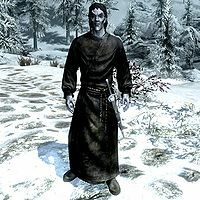 Faldrus is a Dunmer elemental mage who can be randomly encountered wandering in the wilderness. He is on a pilgrimage to the Shrine of Azura and may point you to it. When he arrives at Azura's shrine, he will join Aranea Ienith in front of the statue and raise his arms in praise. However, he will no longer provide further dialogue options. When near him, he will greet you with: "I'm on a pilgrimage to the Shrine of Azura, the Goddess of Twilight. If you'll excuse me." If asked about the location of the shrine, he will respond: "In the mountains to the northeast. I'll mark it on your map." Visit the Shrine of Azura: Help find and repair Azura's Star. Even when he is at the shrine, he will give the same dialogue responses as he does when originally met and has no further dialogue. The location for the Shrine of Azura may not appear on your map, despite Faldrus saying that he will mark its location for you.